In recent years the bedroom has been elevated to a place of beauty rather than a mismatch of furniture to hide behind closed doors. Today’s bedrooms are interior spaces to be respected and treated with love as they offer a much-needed haven to rest and relax. 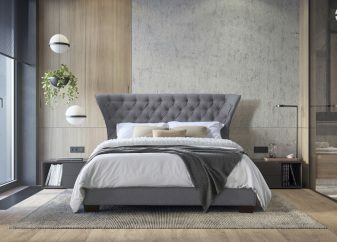 The focal point of any bedroom is the bed, and for this a statement bed is a must. Georgia is that bed. A bold, buttoned, large headboard, with graceful sweeping edges, offering the hint of a winged effect which looks elegant and sophisticated. Simply dress with fabulous bedding for a stunning centre piece never to be hidden away.